Over the course of a week, Idaho Fish and Game staff and community volunteers at Boundary Smith Creek, McArthur Lake, and Coeur d’Alene River Wildlife Management Areas were able to put bands on over 700 ducks. If you or a youngster you know are interested in waterfowl hunting, come join IDFG at the Clark Fork Delta on September 30th for a day of learning methods and techniques while in the duck blind. All participants will be paired up with experienced waterfowl hunters ready to mentor and share their wealth of hunting knowledge. The kids will be out at first light for a chance at some quackers and honkers, spend a couple hours in the blind, and will come back for a lunch and demonstrations on calling, dog retrieving, and duck identification. Aspiring Waterfowl Hunters: Join our local Fish and Game staff in Nampa on November 19 to learn the basics of waterfowl hunting. The course includes both classroom and field instruction in rules and regulations, waterfowl ID, where to hunt, duck calling, gear, field dressing, etc. Register by November 11; check the flyer for more details. Waterfowl Hunting Season Underway in the Idaho Panhandle! Every year around early December, Conservation Officers are called to assist with duck hunters in distress. Aspergillosis is caused by a fungus, Aspergillus fumigatus. The fungus is present in the environment. In birds that are immunocompromised or stressed, the fungal spores can invade the respiratory tissues and create matts of fungal hyphae. Aspergillosis is found in soil across most of North America and been associated with mortality events in many areas in both waterfowl and raptors. Aspergillosis had been documented in waterfowl and raptors in Idaho. Birds affected by aspergillosis are usually thin, lethargic and may present with open mouth breathing. Aspergillosis tends to be a chronic disease but can develop quickly depending on the number of spores inhaled. In birds that are chronically infected, either yellow to white thickened areas or thick mats of white to green fungus are present in the lungs and airsacs. Avian influenza is caused by an influenza type A virus. There are 144 different types of avian influenza viruses known. Avian Influenza viruses are categorized into two groups, high pathogenity and low pathogenicity, based on the extent of illness and death they cause in domestic poultry. Avian influenza is found worldwide including North America. The disease is found in domestic poultry and wild waterfowl, typically in the low pathogenicity forms. 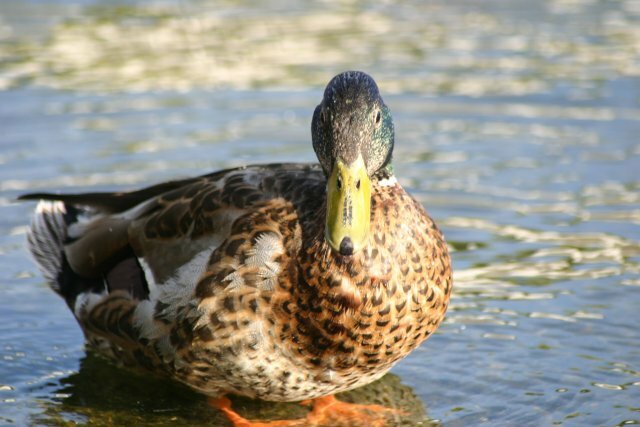 Avian Influenza has been found waterfowl and raptors in Idaho. Avian influenza can cause a variety of clinical signs in birds including lack of energy and appetite, decreased egg production, soft-shelled or misshapen eggs, swelling of the head, eyelids, comb, wattles, and hocks, purple discoloration of the wattles, combs, and legs, nasal discharge, coughing, sneezing, lack of coordination, diarrhea, or sudden death without clinical signs. At necropsy, nasal discharge, greenish, watery diarrhea and swelling around the eyes and neck can be seen. In addition, multifocal necrosis of the pancreas and liver, pulmonary congestion and edema, subepicardial hemorrhage, and myocarditis can be seen.